When I was in college one of the two or three best courses I took in my entire college career was Greek Tragedy. It was taught by Dr. Robert Palmer, an old-school classicist. It is not a course I will forget. That was some forty-five years ago, however, so I figured I was due for a review. This course filled the bill. This version of Greek Tragedy is one of the “older” Great Courses, published in 2000, and as such is not so graphics-intensive as some of the more recent offerings. That made it great for listening to on my walks. Professor Vandiver is a first-class lecturer. Her lectures are clear and easy to listen to. She not only covers the literary aspect, but also discusses the staging of the various surviving plays. She clearly distinguishes between where the author drew from the original myth and where he (always “he,” sorry) embellished, added, or modified the myth we know from other sources. Older does not mean inferior. The course was thoroughly enjoyable. This was a most enjoyable course. I was familiar with some of the material, but I learned a lot. One of the things that Professor Podany made clear was that while we often think of Mesopotamia in terms of the great empires, Assyria, Babylonia, Persia, for much of its history Mesopotamia was made up of multiple kingdoms and city-states. One of the great things about this region in ancient history is the amount of written evidence that we have. The decipherment of the cuneiform script in the nineteenth century provided a wealth of information. Writing was done on clay tablets. Those clay tablets were either intentionally preserved by firing in kilns or accidentally preserved when a city was destroyed by fire. There is a lot of boring administrative material, but also many other types of documents. We have legal documents such as court records, letters between kings, and even letters from the daughters of kings who were married off to peer or client kings. Professor Podany’s presentation is engaging and her British accent is a delight to listen to. If the material interests you, you will love this course. I have listened to other courses by Robert Garland and have always enjoyed them. This particular course was especially good. The material is not new to me. I was a classics major in college, meaning that I studied the Latin and Greek languages as well as Greek and Roman history, literature, art, and culture. Still, it’s always fun to review and there is always the opportunity to learn something new or discover a different perspective. Athenian democracy was truly a democracy as far as it went. All free males in Athens were expected to take part in the governance of the state. There were a variety of roles to fill and everyone took his turn. Of course, this represented only a small portion of the total population. Women were excluded as were slaves. And it was a slave-based society that allowed the free men to have their democracy. Of course the democracy wasn’t seamless and there were times when tyranny or oligarchy ruled the day. Still, overall Athens had a strong track record of democracy until the Macedonians put an end to it. This course was recorded in the aftermath of the 2016 presidential election and is heavily influenced by the result. Garland is no fan of the winner of that election. While the lecture series from the Great Courses are designed to be mostly evergreen, and the bulk of this course which focuses on the ancient world will be as well, it will be interesting to see how those parts referring to the election and its aftermath hold up after a couple of additional election cycles. Nonetheless, if you are interested in the ancient world and its history and governance I can highly recommend this course. I recently wrote about listening to an Open Yale course from iTunes on the New Testament. While the production values of iTunes U classes are not as polished as those for The Great Courses, they are interesting because you get to hear recordings of actual classroom sessions. When I was in college we didn’t have computers. Well, we had one DEC System 10 mainframe for all of the Claremont colleges that sat in basement of Scott Hall at Pitzer College. You could get access to it by going to a computer room on one of the campuses that had three or four terminals and you could either play one of a few games or do some basic programming if you had those skills. Few of us did much with that. Today having a laptop is essential to academic life on campus. The professor spoke at the beginning of the course about access to course materials on the server. At the end of the course he stated that the final exam could be emailed to one’s teaching fellow. Some things, perhaps, don’t change. Like students being lazy. At one point the professor said that he could tell that many of the students hadn’t downloaded and read a certain document that he was lecturing on by the blank looks on their faces. The technology has certainly changed. 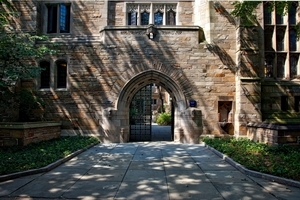 Student attitudes, even at Yale, seem to have not. It has been a long time since I have listened to an iTunes U course, and much as changed in that time. iTunes U is no longer available on iTunes for the PC. For mobile devices it is a separate app and not part of iTunes. It appears to me that the number of available courses has been greatly reduced. Compared to The Great Courses the production values on iTunes U courses are inferior. That’s because they are recordings of actual classroom lectures. In the case of this course recording quality varied across lectures. Nonetheless, Introduction to New Testament History and Literature was quite enjoyable. I was familiar with much of the material, but it reinforced some of what I knew and also provided me with new material. The most interesting aspect of this course was the emphasis on the diversity of Christianity in the New testament period. Even within a single book, Acts, for example, different Christianities emerge, such as whether gentile converts need to be circumcised or not. Similarly, the later letters purported to be written Paul have a very different theology from the authentic letters. While the author of Revelation is virulently anti-Roman rule, some of the later epistles preach accommodation. It was interesting stuff, all of it.